The Sheep Whisperer: Orca, Whale of a Tale:Take 2! The Killer Whale got its name from killing other whales, not from killing humans. 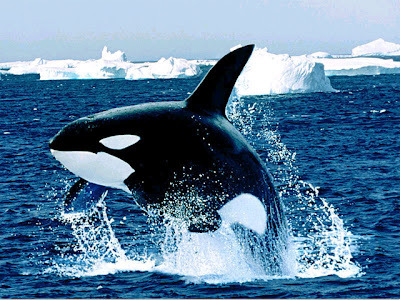 The Killer Whale, or Orca, is the largest predator of mammals & is the only cetacean to do so. A cetacean is any group comprising whales, dolphins, or porpoises. They have no predators besides humans, so they are at the apex of the food chain. I can't understand why sea mammals are so afraid of me! Is it my teeth? Killer Whales have a complex & fascinating social structure. They form what is known as a Matriline, which allows their lineage to be traced by the females in the pod. 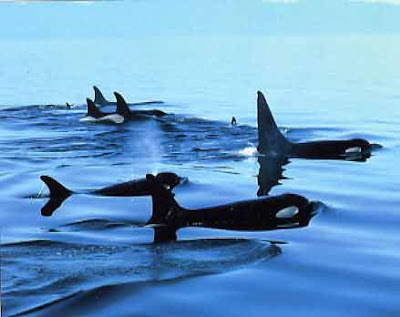 The pod is lead by a mature lead female, followed by her daughters' & other adults' offspring. The group forms very tight bonds & usually stays together for life. We are similar to Italians, because "Family Ties" are really important to us! 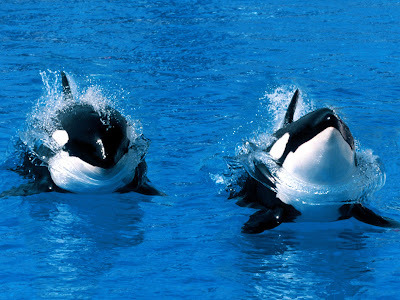 Killer Whales are the largest members of the dolphin family. 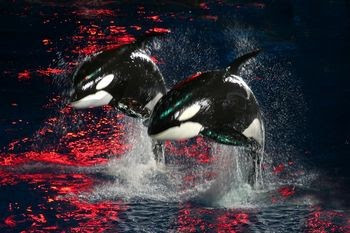 They are known by a number of names, such as Orca, Blackfish, Sea Wolf, & Grampus. 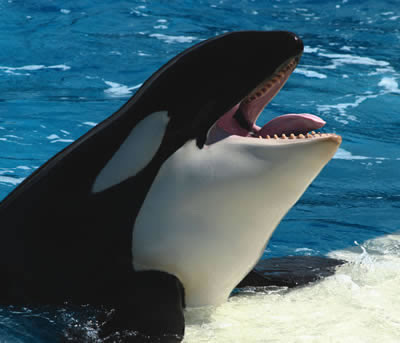 Orca was a name given by the Romans & means "sea monster". In 1929, the "New York Times" characterized these whales as "the most vicious & sinister of living creatures"! We invented the original "Pods"! "Apple" eat Ewer heart out! When it comes to Hunting-"Two are better than one"! Killer Whale males are called bulls. They often have scarred bodies due to the battling that ensues before mating! Males also swim on the outskirts of pods to protect them. Females are called cows & manage the pods efficiently, even disciplining their calves by scratching or restricting their movement! Follow me & I will make Ewe a fisher of...? "Ewe can fill in the blank! assisting them in their hunting for a good "Restaurant"! This is what Ewe call a "Feeding Frenzy"! Sheep & Killer Whales are almost on opposite extremes of the food chain, yet they share a similar need in common. Both animals need to cooperate with their leader & their group to survive. Whether in the sheep pen or the pod, cooperation & leadership are essential! "Cooperate", "Cooperate", "Dance to the Music"! I'm Free Indeed! 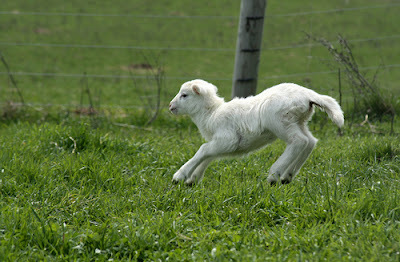 Cooperating with the Good Shepherd will only lead Ewe to "Green Pastures". Enjoy Ewer journey with Him today.